Imagine, if you will, a post-apocalyptic future where humanity exists on the edge of an uneasy truce, following years of civil war. The upstart Rasakans have come out on top, but victory has done nothing to dull their jealousy of the technologically superior Oku - particularly the Forensic Retrospection technology used to travel backwards in time as an observer of pivotal events. As In Retrospect begins, Merit remains the only woman left alive who is capable of performing a Forensic Retrospection. She is a tortured, conflicted young woman who isn't even sure of her own loyalties, much less who she can trust. The Rasakans want her to use the technology to investigate the murder of General Zane, the Oku commander who betrayed her with his inexplicable surrender, but she suspects there's far more to their demands than a simple desire to see justice served. 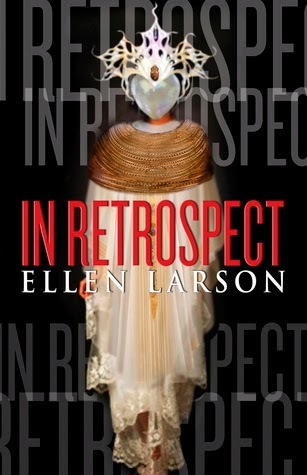 As murder mysteries go, Ellen Larson has crafted a solid tale, one with enough deception and suspicion to keep even the most jaded reader guessing. While there are a few twists and turns that seem a bit contrived, the story doesn't rely so heavily upon them that it suffers in any way. Instead, it's the nature of the telling, the jumping between three different times, that drives the mystery. Each chapter slowly unveils the truth about Merit, Zane, and the world they inhabit, building connections and linkages over time that serve to bring the story together. The characters here are the strongest element of the story, well-developed players who deftly avoid being pigeonholed as mere heroes or villains. Larson really seizes upon the complexities of civil war, exploring both sides of the conflict through changing loyalties, betrayals, and changes of heart. Merit is difficult to get a grasp on early, making for a difficult beginning to the novel, but once she breaks her silence and begins allowing her emotions to show, she becomes a compelling protagonist. Lena and Eric present and interesting mystery themselves, and while they don't get the same exposure as Merit, they certainly test the reader's assumptions. Where the story faltered for me is in the world-building. We're over 1300 years in the future, but much of the story feels like it could be happening 13 years from now. The dialogue is very contemporary, and there's very little 'wow' factor to our technological progress. There's a lot of talk about technology, and how the whole Forensic Retrospection process really works, but it's more 'tell' than 'show'. What I found the most challenging, however, was the lack of narrative description. Larson sketches the outline of the world, but leaves the reader to imagine the colors and the textures. It's not something that necessarily detracts from the story, but once you stop and wonder what something or someone looks like . . . well, you realize what's missing. As for the central theme of time travel, and the question as to whether one can truly alter the past, I quite liked the way Larson explored that. I won't spoil the conclusion, since that question is integral to the plot, but it's a satisfying resolution that doesn't try to get away with avoiding the question.